Illustrate covalent bond formation with Lewis electron dot diagrams. Ionic bonding typically occurs when it is easy for one atom to lose one or more electrons and another atom to gain one or more electrons. However, some atoms won’t give up or gain electrons easily. Yet they still participate in compound formation. How? There is another mechanism for obtaining a complete valence shell: sharing electrons. When electrons are shared between two atoms, they make a bond called a covalent bond. Because two atoms are sharing one pair of electrons, this covalent bond is called a single bond. These two atoms can do the same thing that the H atoms did; they share their unpaired electrons to make a covalent bond. There are two different types of electrons in the fluorine diatomic molecule. The bonding electron pair makes the covalent bond. Each F atom has three other pairs of electrons that do not participate in the bonding; they are called lone electron pairs. Each F atom has one bonding pair and three lone pairs of electrons. We note that the H atom has a full valence shell with two electrons, while the F atom has a complete octet of electrons. Use Lewis electron dot diagrams to illustrate the covalent bond formation in HBr. Use Lewis electron dot diagrams to illustrate the covalent bond formation in Cl2. (It does not matter on what side the second H atom is positioned.) Now the O atom has a complete octet around it, and each H atom has two electrons, filling its valence shell. This is how a water molecule, H2O, is made. Use a Lewis electron dot diagram to show the covalent bonding in NH3. Use a Lewis electron dot diagram to show the covalent bonding in PCl3. Count the total number of valence electrons. Add extra if the species has negative charges and remove some for every positive charge on the species. Write the central atom and surround it with the surrounding atoms. Put a pair of electrons between the central atom and each surrounding atom. Complete the octets around the surrounding atoms (except for H). Put the remaining electrons, if any, around the central atom. Check that every atom has a full valence shell. Let us try these steps to determine the electron dot diagram for BF4−. The B atom is the central atom, and the F atoms are the surrounding atoms. There is a negative sign on the species, so we have an extra electron to consider. 1. Count the total number of valence electrons. B has 3, each F has 7, and there is one extra electron: 3 + 7 + 7 + 7 + 7 + 1 = 32. 2. Write the central atom surrounded by surrounding atoms. 3. Put a pair of electrons between the central atom and each surrounding atom. This uses up eight electrons, so we have 32 − 8 = 24 electrons left. 4. Complete the octets around the surrounding atoms (except for H). This uses up 24 more electrons, leaving 24 − 24 = 0 electrons left. 5. Put the remaining electrons, if any, around the central atom. There are no additional electrons to add to the central atom. 6. Check. The B atom has eight electrons around it, as does each F atom. Each atom has a complete octet. This is a good Lewis electron dot diagram for BF4−. The H and O atoms have the proper number of electrons, but the C atom has only six electrons around it, not the eight electrons for an octet. How do we fix this? The bond between the C and O atoms is a double bond and represents two bonding pairs of electrons between the atoms. If using the rules for drawing Lewis electron dot diagrams don’t work as written, a double bond may be required. What is the proper Lewis electron dot diagram for CO2? Each O atom still has eight electrons around it, but now the C atom also has a complete octet. This is an acceptable Lewis electron dot diagram for CO2. What is the proper Lewis electron dot diagram for carbonyl sulfide (COS)? 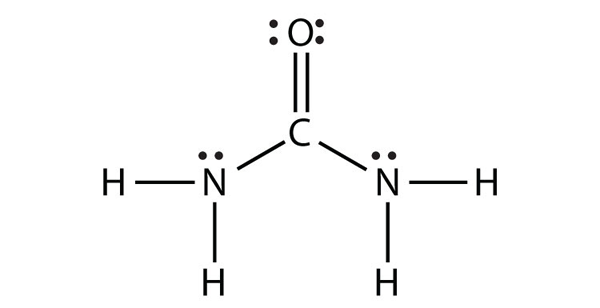 Acetylene is an interesting example of a molecule with two central atoms, which are both C atoms. Polyatomic ions are bonded together with covalent bonds. Because they are ions, however, they participate in ionic bonding with other ions. So both major types of bonding can occur at the same time. Vitamins are nutrients that our bodies need in small amounts but cannot synthesize; therefore, they must be obtained from the diet. The word vitamin comes from “vital amine” because it was once thought that all these compounds had an amine group (NH2) in it. This is not actually true, but the name stuck anyway. All vitamins are covalently bonded molecules. Most of them are commonly named with a letter, although all of them also have formal chemical names. Thus vitamin A is also called retinol, vitamin C is called ascorbic acid, and vitamin E is called tocopherol. There is no single vitamin B; there is a group of substances called the B complex vitamins that are all water soluble and participate in cell metabolism. If a diet is lacking in a vitamin, diseases such as scurvy or rickets develop. Luckily, all vitamins are available as supplements, so any dietary deficiency in a vitamin can be easily corrected. A mineral is any chemical element other than carbon, hydrogen, oxygen, or nitrogen that is needed by the body. Minerals that the body needs in quantity include sodium, potassium, magnesium, calcium, phosphorus, sulfur, and chlorine. Essential minerals that the body needs in tiny quantities (so-called trace elements) include manganese, iron, cobalt, nickel, copper, zinc, molybdenum, selenium, and iodine. Minerals are also obtained from the diet. Interestingly, most minerals are consumed in ionic form, rather than as elements or from covalent molecules. Like vitamins, most minerals are available in pill form, so any deficiency can be compensated for by taking supplements. Every entry down through pantothenic acid is a vitamin, and everything from calcium and below is a mineral. Lewis electron dot diagrams can be drawn to illustrate covalent bond formation. Double bonds or triple bonds between atoms may be necessary to properly represent the bonding in some molecules. How many electrons will be in the valence shell of H atoms when it makes a covalent bond? How many electrons will be in the valence shell of non-H atoms when they make covalent bonds? What is the Lewis electron dot diagram of I2? Circle the electrons around each atom to verify that each valence shell is filled. What is the Lewis electron dot diagram of H2S? Circle the electrons around each atom to verify that each valence shell is filled. What is the Lewis electron dot diagram of NCl3? Circle the electrons around each atom to verify that each valence shell is filled. What is the Lewis electron dot diagram of SiF4? Circle the electrons around each atom to verify that each valence shell is filled. Draw the Lewis electron dot diagram for each substance. 8. Draw the Lewis electron dot diagram for each substance. 9. Draw the Lewis electron dot diagram for each substance. 10. Draw the Lewis electron dot diagram for each substance. 11. Draw the Lewis electron dot diagram for each substance. Double or triple bonds may be needed. 12. Draw the Lewis electron dot diagram for each substance. Double or triple bonds may be needed. 13. Draw the Lewis electron dot diagram for each substance. Double or triple bonds may be needed. 14. Draw the Lewis electron dot diagram for each substance. Double or triple bonds may be needed. Covalent Bonds by Jessie A. Key is licensed under a Creative Commons Attribution-NonCommercial-ShareAlike 4.0 International License, except where otherwise noted.